Discover how rendering in the cloud could save you time and money. Cloud rendering has been the big issue for many artists, particularly those working remotely or in small studios. The big player in the market is Google Zync, but newcomers such as the UK’s Yellowdog are also catching on. To uncover how feasible it is, we caught up with lighting and compositing freelancer Eva Ng, who turned to the cloud to hit deadline on her final project at Gnomon School of Visual Effects. But it still wasn’t enough and as many artists find, if you’re not at a major VFX studio, access to super-powered hardware isn’t an option. Eva looked into cloud rendering as a solution and Google’s Zync platform was recommended. The idea is simple; you send render-intensive work to the cloud, where you can make use of the power and scalability of Google to receive high-quality results at speed. 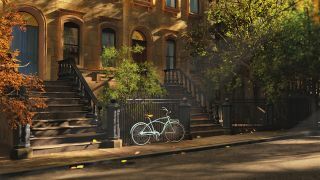 Eva judged her NYC Village project would have taken 18 hours to render but with Zync it took four hours, and this included rendering the background and foreground. “I was immediately amazed by the power and time I had saved – I could use that extra time for other developments and iterations, which would allow me to explore more options and be more creative,” explains Eva. Cloud rendering isn’t completely new, but what sets Zync aside from other ‘in the cloud’ renderers is the ‘on demand’ nature of the performance; when you don’t need it, there’s nothing to pay for – no bills, no overheads. More so, Zync allows you to choose how many machines and cores are needed and the rough cost of the project is shown up front before any work is done. “I also discovered in my account settings that I could set a price limit, just in case I was worried about going over my budget – that kind of thing is really useful when you’re a freelance artist and you’re working on a budget,” Eva says. The successful take-up of cloud rendering has had the knock-on effect of support from software developers, for example Nuke, V-Ray, Solid Angle and RenderMan all support the renderer. And now a new Zync Render plug-in for Maya means users can render 3D scenes on Google Cloud with ease – and legally. Users can now make use of up to 500 machines per account, scaling to 32,000 rendering cores. Maya customers could see up to a 10x improvement in efficiency due to the new system. This should allow multiple rendering jobs to start instantaneously, cutting waiting times and accelerating production. This surely means 3ds Max and the newly acquired Arnold should follow suit. But ultimately it means artists like Eva can make use of a high-end render capability to reduce costs and time. This article was originally published in 3D World magazine issue 210. Buy it here.